GTA V has some incredible missions, particularly the multi-character heists that see you tackling objectives from multiple perspectives, giving you the sense you’re in an expensive movie. Despite this, sometimes you just want to play as Trevor and watch the world burn. Looking for more? Here are the best GTA V mods. Trevor is a great character for when you’re feeling destructive. It just doesn’t feel right to go on a murder spree with Michael or Franklin, whereas Trevor revels in the carnage. But for PC players, there is a better solution. 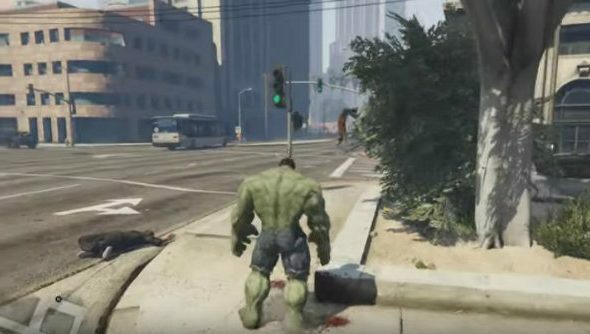 Though it isn’t the first mod of its kind, the Hulk Script mod – a Patreon funded masterpiece from JulioNIB – is the closest anyone has ever come to bringing the mean green monstrosity to Los Santos. In fact, it’s much more convincing than any actual Hulk games I’ve seen, no doubt helped along by GTA V’s brilliant Euphoria engine. In the mod, Hulk screams, smashes and leaps through the city, landing with an Earth-shattering stomp that sends a shockwave outwards. Cars and dumpsters are thrown around like toys, lampposts can be used as bats and Los Santos’ finest don’t stand a chance – neither do trains for that matter. It’s impressively built, with hulk flailing his arms when he comes into contact with a civilian at a run, sending them ragdolling down the street. You can try out the Hulk script mod for yourself here.